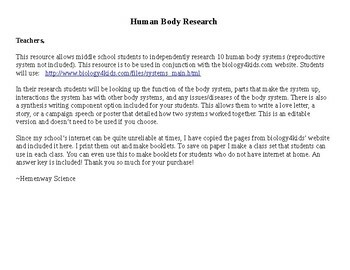 In their research students will be looking up the function of the body system, parts that make the system up, interactions the system has with other body systems, and any issues/diseases of the body system. 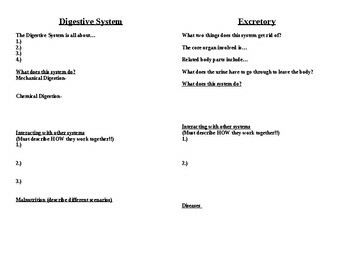 There is also a synthesis writing component option included for your students. This allows them to write a love letter, a story, or a campaign speech or poster that detailed how two systems worked together. This is an editable version and doesn’t need to be used if you choose. 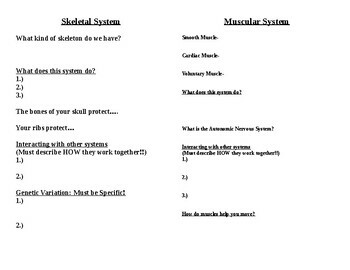 Since my school’s internet can be quite unreliable at times, I have copied the pages from biology4kids’ website and included it here. I print them out and make booklets. 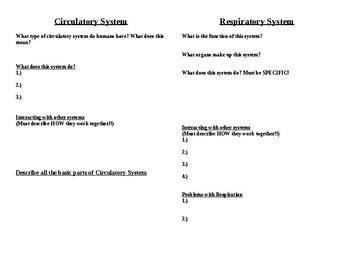 To save on paper I make a class set that students can use in each class. You can even use this to make booklets for students who do not have internet at home. This is an EDITABLE Version so you can add to or remove items you choose!